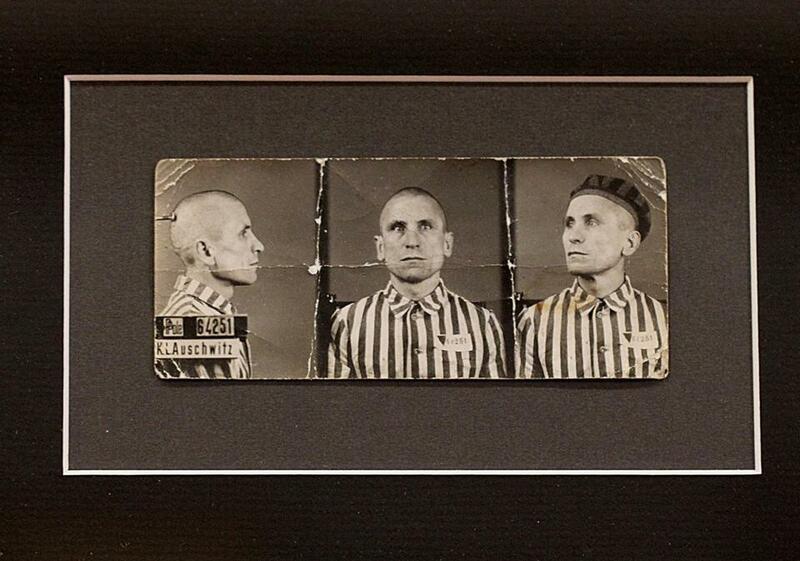 Photos of a prisoner at Auschwitz are displayed at the New England Holocaust Institute and Museum. The entire museum is a single, unassuming room. But that one room is packed full of history. Even this small sampling — English called it “the tip of the iceberg” — hints at the astounding range and depth of his collection, which includes approximately 10,000 World War II artifacts and roughly 3,000 Holocaust items, gathered over the course of 40 years. Some objects seem to spring from the pages of textbooks: 19th-century anti-Semitic posters, a propaganda film strip touting the benefits of the Nazi Party’s euthanasia program, a Brownshirt uniform in mint condition, a “Jude” star from 1930s Germany, a photo of Hitler in civilian uniform speaking with his closest advisers, a Zyklon-B poison gas canister, a morphology reference text that belonged to the medical staff at Auschwitz (where the infamous Dr. Mengele wrought his terror), a concentration camp uniform, and a calendar book that belonged to Oskar Schindler. A roundish man with messy gray-brown hair, English, 55, who has no Jewish heritage, was born in North Adams and lived there until graduating from North Adams State College (now the Massachusetts College of Liberal Arts). After years selling furniture and antiques in upstate New York, he and his wife returned to North Adams eight years ago. Standing amid his propaganda posters, which he considers jewels of his collection, English described his earliest acquisitions, his eyes widening with excitement. English’s boyish pleasure in military items is still very much alive. But it has been deepened by ambition and a sense of historical purpose. He is not a wealthy man. He spends most of his money on historical items, and he often sells off items to acquire new ones. “My vision is this: to eventually have a museum big enough to tell the full story, side by side: WWII, and the buildup of the Nazi Party and the Holocaust. So that people get a clear visual of what went on,” he said. In order to realize a project of this scale, however, he will have to get financial backers, and so far he has not found any. Just for comparison, the United States Holocaust Memorial Museum in Washington cost $168 million to build, funded by the federal government and 200,000 private donations. It employs nearly 400 staffers and 300 volunteers, and has seen 34.8 million visitors since it opened in 1993, according to its website. English has no staff, no grants, no private donations — yet. The museum does have a website (www.nehi2012.exai.com) up and running. But for now he is also the sole administrator. Even locally, the museum has only just begun to make ripples. Rachel Barenblat, rabbi of the Beth Israel congregation in North Adams, said she had never seen the collection. North Adams is already home to a rich cultural scene that includes the Massachusetts Museum of Contemporary Art (Mass MoCA), one of the largest centers for contemorary art in the counry. English hopes to capitalize on that museum’s popularity, along with that of the Williams College Museum of Art and the Clark Museum, located in neighboring Williamstown. The museum is also a short drive north from Tanglewood, where thousands of people flock every summer. But Zyla also acknowleged the enormous challenge English faces. Education and outreach will become a major part of the mission of his new museum, English anticipates. For the past eight years, he has partnered with nearby Clarksburg Elementary School to teach eighth- graders about the Holocaust, and he would like to begin running similar projects elsewhere. 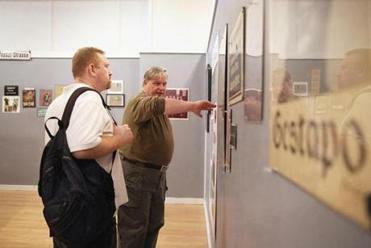 English hopes that his collection will keep the memory of the Holocaust alive in the Berkshires, where most schools do not have the time or resources to travel to the Holocaust museums in New York or Washington.